Triscuit has come out with a new line of Brown Rice Triscuits that, in addition to being made with a blend of whole grain brown rice and wheat, offer varieties that weave in pieces of sweet potato or red beans. What I like about Triscuits new product is that the crackers are baked with 100% whole grain and contains 21g of whole grain per 29g serving. Additionally, the new line of crackers is **free** of high fructose corn syrup, hydrogenated oil, cholesterol and artificial flavors. I remember my Mom and her friends always had Triscuits and dip at all their parties, but once I started reading labels and removing products from my shopping cart that had corn syrup and hydrogenated oil I no longer brought Triscuit home. Now with five new flavors that are all boasting the healthier labels I can add Triscuit back to my shopping cart. I decided to use it in a classic favorite the Chicken Tenders which are loved by old and young alike. I make this in a healthier version by browning the tenders in a skillet to get the crispy crunch and finish the tenders off in the oven. You can make this recipe using Panko breadcrumbs, but its hard to get the perfect crispy crunch. 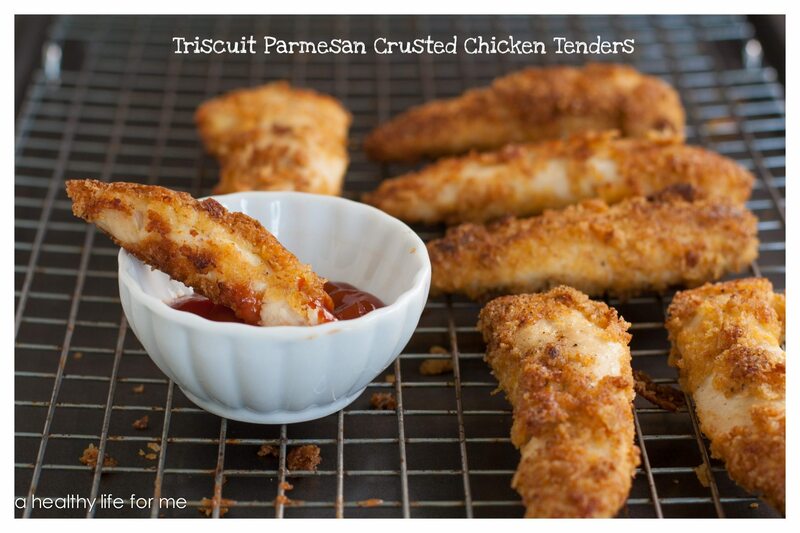 With using the triscuits, the crust was crispy and the tenders were… you guessed it tender. Great to dip in ketchup, marinara sauce, or honey. You can also check out Triscuits Brown Rice and Wheat Pinterest board if you are interested in other recipes using this little cracker. Just because this video reminded me of my High School days I thought I would include it in this post. I actually think I had that pink outfit, earrings and all. EEEK! Add Triscuits to bag and crush till fine crumble. 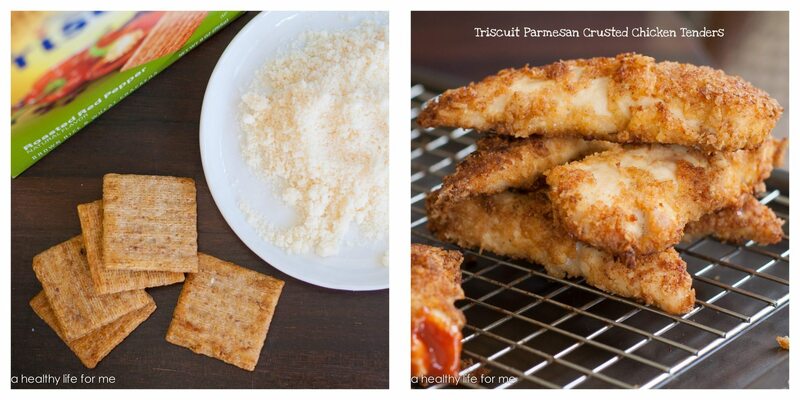 On a medium plate add Triscuit crumbs and Parmesan and mix to combine. On another medium plate add egg and water and whisk to blend. 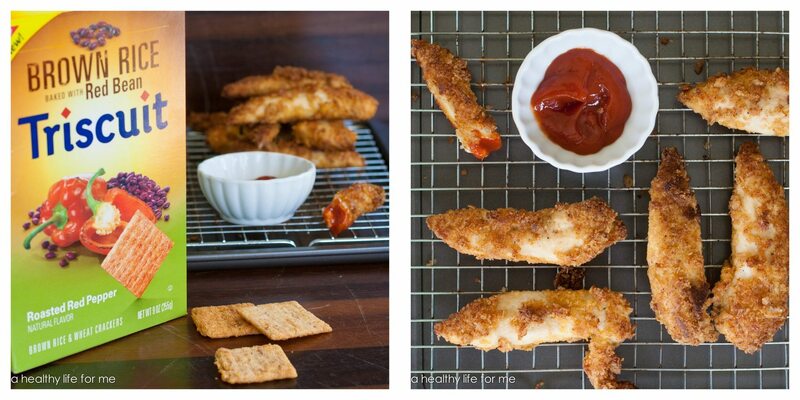 Take tenders one at a time and coat with egg mix and then coat with Triscuit mix and set aside. Add 3-4 tenders at a time. Cook 1-2 minutes on other side. Set tenders on broiler pan and bake for 20-25 minutes.